I had some leftover ingredients from making Mi Ga last weekend, half a bag of bean sprouts and a bunch of Chinese chives. I marinaded some xa xiu last night so it will be ready for lunch today. I ate something similar to this at a Cantonese restaurant I used to go to except they used chow fun noodles. It was extremely greasy but so so good. The spiciness of the chives really go well with the crunchy bean sprouts. Such an easy lunch to put together, I must do this more often! 1. Prepare xa xiu like in my earlier recipe, sliced thinly. 2. 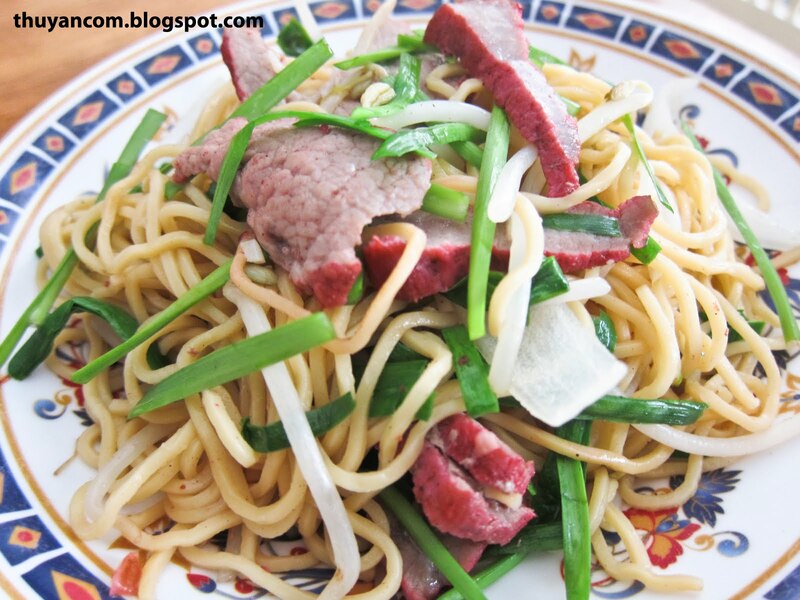 Boil the noodles until it slightly cooked, you will finish the cooking process later on. Rinse with cold water, drain, and let dry in colander. 3. Cut chives into 1-2 inch section. 4. Combine 1 tablespoon of oyster sauce, 1/2 tablespoon of soy sauce, a couple squirt of fish sauce and 1/2 tablespoon of sugar to make a sauce. 5. Heat up a good amount of cooking oil in a wok or pot. Add garlic to oil and stir until fragrance. 6. Add the noodles, stir fry the noodle making sure the noodle is coated with the oil. 7. Add the sauce to the noodle and make sure it evenly distributed. 8. Add the xa xiu and slice onions. 9. Add the green sprouts and chives at the very end so yo don't over cook them.